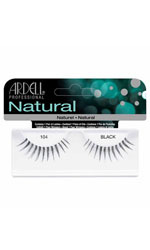 Ardell Naturals 117 Brown False Eyelashes, are easy to apply and blend flawlessly with your natural lashes. Beautifully curved and feathered giving you a high definition look, everyday all day. How to apply: Thoroughly clean your eyelashes and eyelids so they are makeup and oil free. To check the fit lay lash on top of your natural lash, if it extends beyond your lash line, trim the excess with small scissors. Squeeze a thin line of LashGrip Adhesive along the lash band. A toothpick can be used to spread it evenly. Wait about 30 seconds for adhesive to set. Place the lash as close to your natural lash line as possible, then use your fingertip to gently press along the band to secure in place.